I grew up loving cameras. One of my first toys was a toy camera, and I had many cameras over the years. Although my father was a gifted photographer and taught me some photography basics, I was not a serious, artistic photographer. I was, however, from my early years a great fan of chronicling everyday life with snapshots. The camera of my teen years was the Kodak 110. It was a small, slim instamatic camera designed to fit into a purse or pocket. I took it everywhere! 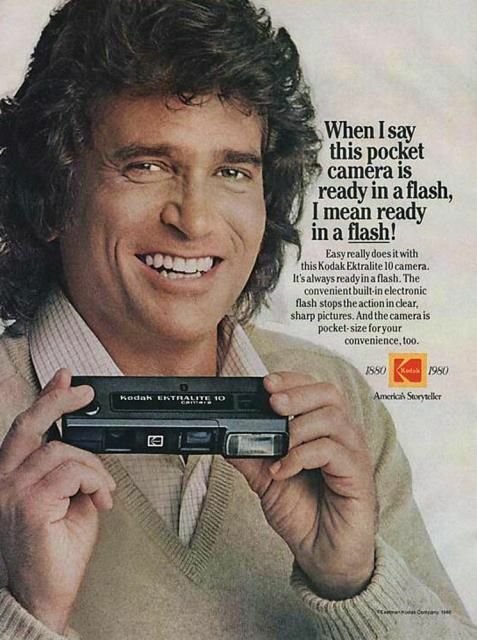 It had built-in flash, which was great. Michael Landon was the spokesperson for this camera, and appeared in print ads and commercials. 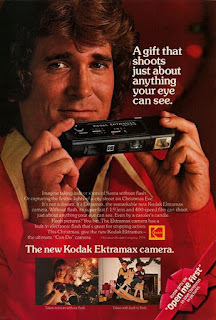 You'll find a 1979 commercial below ... it gives a good glimpse at how this little camera worked. I have a couple of digital cameras now, but take most pictures with my phone. I love the ease of phone photography, and it works great for everyday snapshots. What camera did you grow up with? Do you still enjoy taking pictures? I'd love to hear from you in the comments, below. I have always loved cameras old and new !! When I was ten my parents gave me an Instamatic camera, when I was 18, I got a "real camera"- a 35 mm Fujica. Sadly, my husband and I lost in while on vacation (in my late 20's.) We bought a Pentax with a kit lens, and it wasn't as nice. My favorite camera growing up was a polaroid. I loved watching the picture develop! I love this throwback post! I'm gonna date myself, but my very first real camera was a Kodak disc. It was square-ish, thin, and trendy, even though the quality of the pictures were pretty bad. But I used it proudly because it was my very own. I use to have one of those! It had belonged to my older sister. I love photography! That probably started the spark! Thanks for visiting! I enjoyed reading your retro camera memories!